Tomato is a fruit of tomato plant, yes !!! it is a fruit. Botanically it is classed as a fruit, not vegetable. Tomatoes are easy to grow in your own kitchen garden. A couple of tomato plants can give you hundreds of tomatoes. As today I am telling you many benefits of tomatoes with regard to skin, hair and health after reading this you all will surely love to grow your own tomato plant. One more interesting fact about tomato is that 94.5% of tomato is water so, we can say that it is one of the most hydrating fruits. Down below I mentioned 40 benefits of tomatoes which everyone should know. Tomatoes are full of vitamin C and also provide astringent effect when applied topically. Four tbsp of Tomato juice and add few drops of lemon in it apply it on open pores this will shrink open pores and gives a glow appearance to your skin. Unlike other fruits for glowing skin tomato can also give you a glowing and healthy skin. Tomatoes are full of vitamin C, lycopene, beta-carotene. These components will give a glowy effect to your skin, rejuvenates skin, promote cellular growth . Tomatoes either taken as food or its juice applied topically will help your skin to absorb more oxygen. Furthermore it provide natural skin pampering treatment which will make you look younger. In addition to this tomato provide moisture to skin which will prevent wrinkles on skin. It gives a better complexion by changing color tone of your skin. Furthermore vitamin C improves your complexion and give bleaching effect. Having good amount of lycopene every day helps you to have healthy and youthful skin. This will also help in cell growth and will fight cellular damage. Tomato also moisturizes your skin. Tomatoes are rich in vitamin c. In addition to this it also control excess oil production which ultimately reduces acne. Tomatoes are also anti-inflammatory which furthermore soothes acne/ pimples. Tomatoes are full of lycopene. This lycopene fight against cancer. This act as scavenging agent. Tomatoes are best for preventing prostate cancer. Addition to this it also protect breast cancer and cervical cancer. Vitamin C present in tomato also contribute to the anti-oxidant effect. As tomatoes are full of vitamin c this will help to reduce dark spots and fight blemishes. Furthermore this will control oil secretion of your skin. Tomato is juice in nature. It moisturizes your skin and hydrates it as well furthermore adding 2 tablespoons of tomato juice in Aloe Vera gel and apply it for 20 min this will soothes your skin and ultimately treat dry skin too. These tomatoes work as a complexion modifier this will reduce pigmentation and furthermore will resolve the issue of combination skin and gives you even and fairer complexion. Tomatoes control sebum cells on skin. Furthermore this will prevent excess oil secretion on your skin.Tomato juice works great on oily skin. Apply tomato juice on face to reduces excessive production of oil by sebaceous glands. lycophene from tomato helps in washing away the sebum from skin pores. Tomatoes will surely treat your raw, burnt and irritated skin. Cut tomato in halves and freeze it for some time. Take it out from the freezer and gently rub on your skin this will give you cooling effect and and glowy look too. Tomato juice with sugar when rubbed on face act as best exfoliant. Exfoliation is necessary for skin cell renewal as dead cells remove so new cells grow in that place. Furthermore this gives skin a better and even glowy look. Tomato juice will cleanse your skin deeply and because of its astringent effect it also decreases your pore size so that dust will not enter your skin. Your skin will have smooth and glowy skin. Tomato helps to restore hair color as it has lycopene in it. Regular application of tomato juice will protect your hair color. When excess of sunburn damages your hair color tomato juice application on your hair will restore that. Tomato juice application on scalp give prominent removal of dandruff. Furthermore it nourishes your scalp and helps you to fight hair loss too. Tomato juice conditions your scalp and hair and lock moisture in your hair this will ultimately give your hair shiny and lustrous appearance. It works as a great conditioner. Apply tomato juice 15 min before washing your hair and then wash it with cold water, this will give your hair lustrous appearance and your dullness will not be your problem anymore. The human body is designed to maintain a pH of 7.36. You can maintain pH balance by including foods that contain calcium, magnesium, potassium and sodium. All these essentials are found in flesh and seeds of tomato. So by eating tomato you can maintain the pH balance of hairs. As tomatoes are full of vitamin c which will treat psoriasis, eczema furthermore it boosts up the collagen and strengthen your hair. You can use tomato juice as conditioner too. Protein is present in tomatoes in high amount. Which helps in hair growth. Tomatoes stimulate hair follicles so that hair grow at faster rate. Tomatoes also fight hair loss and cellular damage. These tomatoes will regulate your sebaceous glands and thus prevent excess sebum production from your skin. It helps to keep oily and greasy hair at bay. Tomato is full of Vitamins like A, B, C and E which are excellent stimulants for healthy hair. They help prevent hair loss, give natural shine and help treat scalp odour and dandruff and promote hair growth. Furthermore it will fight hair loss. Tomatoes have high amount of protein in it. Make tomato puree of 2-3 ripened tomatoes and add it with oil. Apply this mixture to your hair and then wash. This will surely treat your dry hair. You can use his remedy as frequently as you need it. A lot of sun exposure or regular swimming routine imparts bad effect on your hair. Sometimes your hair get stain in addition it they look dry, frizzy and dull. Tomato is best to treat this kind of hair. Add 2-3 tomatoes raw to your salad in your daily routine. Also apply tomato juice to your hair for 20min and then wash your hair. Tomatoes help to treat itchy scalp. It also prevent dandruff, scalp eczema, psoriasis. Tomato contain vitamin C which fights dandruff. It also provide collagen to the hair and promotes proper tissue growth of scalp. Take the pulp of 2-3 ripe tomatoes to add few drops of lemon in it and apply this pack on your scalp for 30 mints. Then wash your hair and observe the change. fight certain eyesights disorders furthermore it prevents night blindness. This is one of the best eye benefits of tomatoes. A serving of tomatoes provides the daily value for vitamin K, which promotes bone health. Vitamin K helps to activate osteocalcin. The benefit of asteocalcin is that it mineralizes calcium molecules inside of the bone and makes your one strong. Drink fresh raw tomato juice as it is filled with a lot of vitamins and minerals in addition to this it is super juicy and has a good amount of fiber in it. Thus fresh raw tomato juice serves as a superfood. It is filled with Thiamine, vitamin B6, folate. This helps in the metabolism of our body cells regulates it and improves it. furthermore it protects us from cardiovascular diseases. Some research also shows that lycopene may lower LDL or “bad” cholesterol which lowers stroke risk. Tomatoes are rich in vitamin k and provide cure to all problems related to a blood clotting disorder. The jelly surrounding tomato seeds has many benefits as the juicy, yellow fluid around the tomato seeds has the highest blood thinning quality. Two main acids named coumaric acid and chlorogenic acids are found in tomato which helps fight against nitrosamines which are the main carcinogens found in cigarettes. There is high quantity Vitamin A in tomato which reduces the effect of carcinogens. Consuming tomato daily reduces the risk of hypertension/high blood pressure. Tomato contains an impressive level of potassium. Potassium helps to reduce tension in blood vessels and arteries which indirectly helps to lower stress on the heart by eliminating hypertension. Tomatoes are packed with many nutrients. 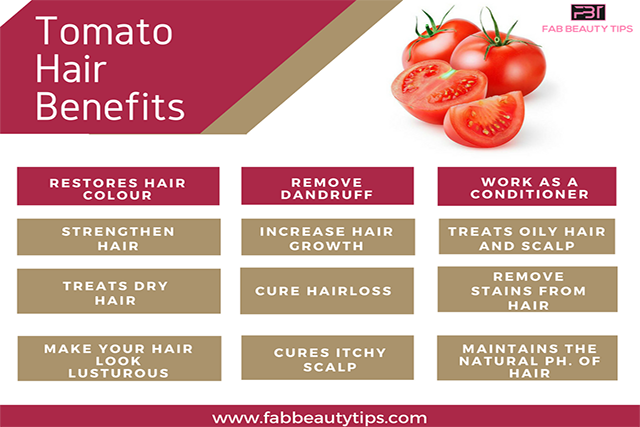 I hope this article benefits of tomatoes has helped you in a way if you want regular short tips on beauty and health and facts related to both don’t forget to follow us on Instagram, Facebook & Twitter. And do leave your comment below and share it with your friends, Thank You. I knew a few benefits of Tomatoes but these are so many facts. Thanks for sharing the wonderful blog. I had no clue it can be used to get rid of black heads! And acne too? Can we use it on children if they are having acne issue ? Tomato is one my favourite things to well eat as well as use on my skin. But little did I know about the various benefits it offers – nice to learn a little bit more about tomatoes. I, can not agree more on the benefits of this miracle fruit ( thou we call it a vegetable ) but I’ve personally used tomatoes for shrinking pores & it works!! I used to play volleyball in school and my mom used to be after me to lighten my tan. At that time, we researched and came to know tomato as a natural bleach for the skin. And I liked its tangy taste but never knew its enormous benefits and its good for hair. 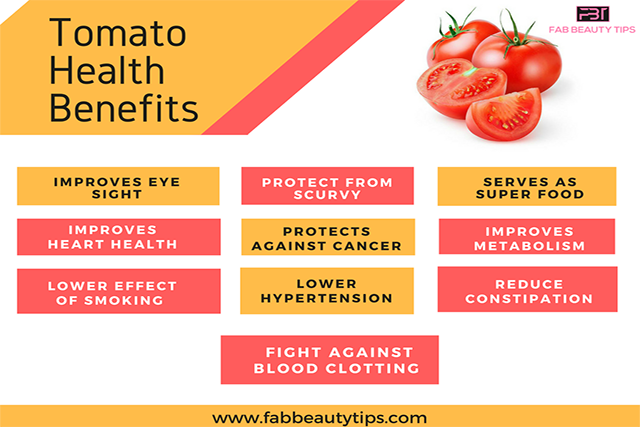 You have explained so many amazing benefits of tomatoes i will surely share this article with my friends keep posting amazing content like this. Thank you..! Wow, till now I only lived eating tomatoes, it seems I’ll have to double up my tomato shopping. As now they need to be a part of my skin and hair care regime as well. I know tomatoes are beneficial but so many benefits, I don’t know. you have said it works as a sunscreen too but how? apply pack before going out and then rinse off? My skin loves tomatoes. 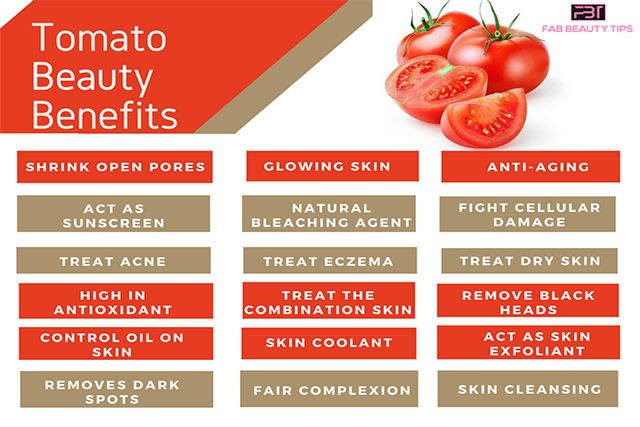 I know tomato has so many health and beauty benefits. But the hair benefits seem very interesting to me as I was not aware of those. Great piece of information. That’s an exhaustive list of benefits of tomatoes. I didn’t know its so beneficial. Thanks for this informative post. I am surely using it for skin and hair.. I never knew they had so many benefits for skin and hair too. Definitely worth trying. 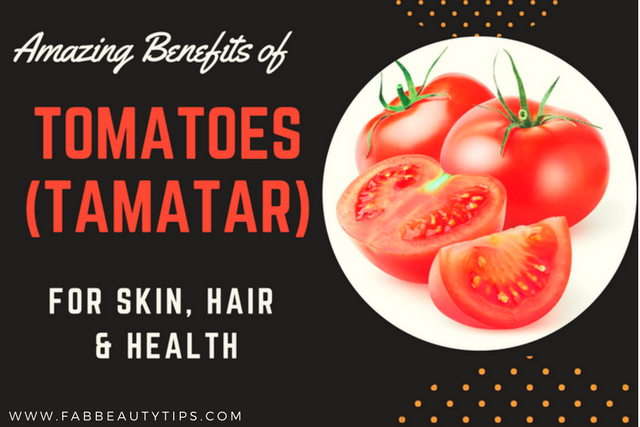 I remember using Tomato as a natural de-tan and to reduce the acne scars. Also, if we rub tomato skin on knees and elbows the sin gets softer. Lovely list and thanks for sharing such benefits.